The area in and around Grand Canyon Village (AZ) on the south rim of the Grand Canyon has not one, not two, but three railroad stations. The most famous is the depot built in 1910, which we looked at last week. A short distance away from the railroad depot is the national park’s Backcountry Information Center. This is the place to visit if you want permits and information about hiking out into the countryside around the canyon (no thanks, big scary animals), or down into the canyon itself (no thanks, people actually die doing it). The transport-minded visitor, sensibly remaining on the canyon’s rim to walk the footpaths or ride the shuttle buses, might be given pause for thought by its appearance. It looks for all the world like a railway station. The Backcountry Information Center is situated on the southern leg of the “wye”, a turning triangle for trains to Grand Canyon from the town of Williams. From the track side, the resemblance to a railway station is even more striking. As a building, it’s rather neat. It’s essentially a modern take on the historic Grand Canyon train depot, but avoiding the pitfall of being mere pastiche. It shares with that earlier building an open porch at one end, and a stepped set of pitched roofs. It’s of wooden construction rather than log construction, possibly over a metal frame (I haven’t found out for certain) and has larger glass windows than the historic train depot could have included using contemporary building techniques. The uppermost of the eaves is glazed to let a great deal of natural light into the heart of the building. It’s a very pleasant structure, respectful of its locale and mindful of its local historic precedents. The reason that the Backcountry Information Center looks like a railroad depot is for the very good reason that it is a railroad depot, although it’s one that has never seen train passengers. It was built as the Maswik Transportation Center (it is situated next to Maswik Lodge, hence the name), in 1993-94. There was a plan by the then-operators of the Grand Canyon Railway to extend from the historic Grand Canyon railroad depot southwards to the town of Tusayan and its airport, just outside the southern boundary of the national park (see here for a write-up in the electronic edition of the Iowa Rail News). Maswik Transportation Center would have been at the heart of this operation. 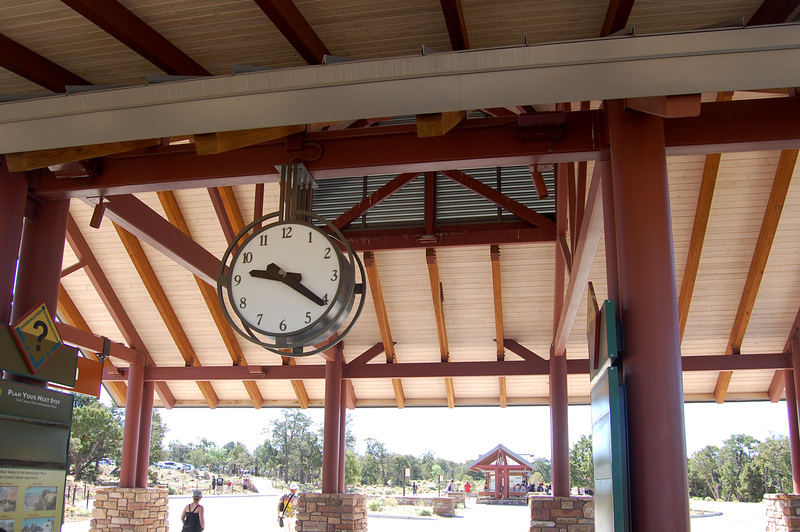 Tusayan would have gained an extremely large park and ride car park, with visitors to the national park being able to use the train to reach Maswik Transportation Center. This would have been a perfect hub for the network of local shuttle buses. But as with so many ideas for sustainable transport development, nothing ever quite came of it, and the Grand Canyon Railway remains a once-a-day operation aimed primarily at tourists, rather than being a significant part of an attempt to promote non-car access to the Grand Canyon. While generally fairly happy with it, the National Park Service’s Grand Canyon design guidance document still manages to find fault with some aspects of the design, noting that the roof shingles should have been doubled-up every five rows to give more texture to the roof, and that the size of the stone blocks in the base of the building is too small (see page 61 of this). Really? That’s fussy. It’s good to see perfectionism in action though, given the rubbish that many other public bodies are happy to accept as public transport design and styling. Yet there are no trains, nor any track at this station, and there never have been. This is the shelter at the Grand Canyon Visitor Center, about a mile or so to the east of Grand Canyon Village. 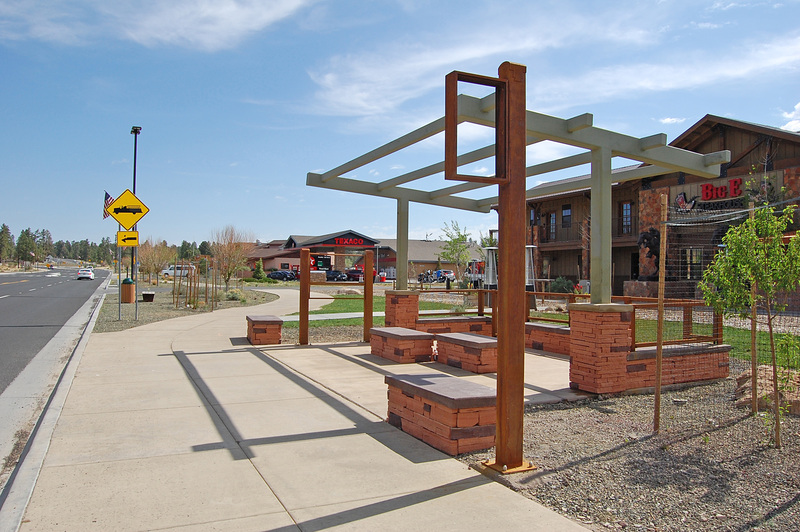 It shares some of the characteristics of the standard National Park Service bus shelter model, particularly in the seating and the rough stone walls at the base. It is much larger and grander though, as befits a railroad station, and uses metal posts and roof coverings rather than wood. It stands at the head of a line of smaller shelters which share the same design aesthetic. It’s easy to imagine a railroad track on either side of these shelters, the bus stop poles and flags removed, and the whole thing as a railroad terminus, with the largest shelter situated behind the bufferstops. 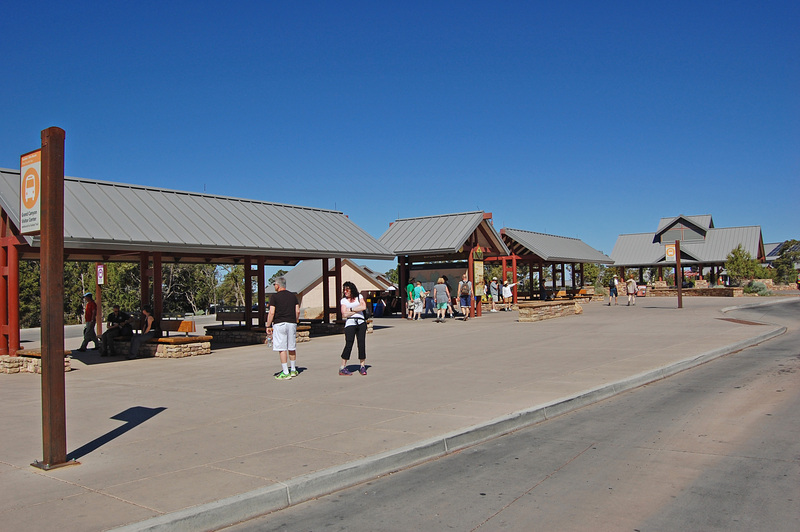 Instead, the shelters today serve a very smart visitor center, at a major interchange on Grand Canyon National Park’s shuttle bus routes. The complex feels a little disconnected from Grand Canyon Village itself, as though these impressive modern facilities have landed in the middle of nowhere. That’s because the shelters and visitor center were planned as a new gateway to a car-free Grand Canyon National Park. 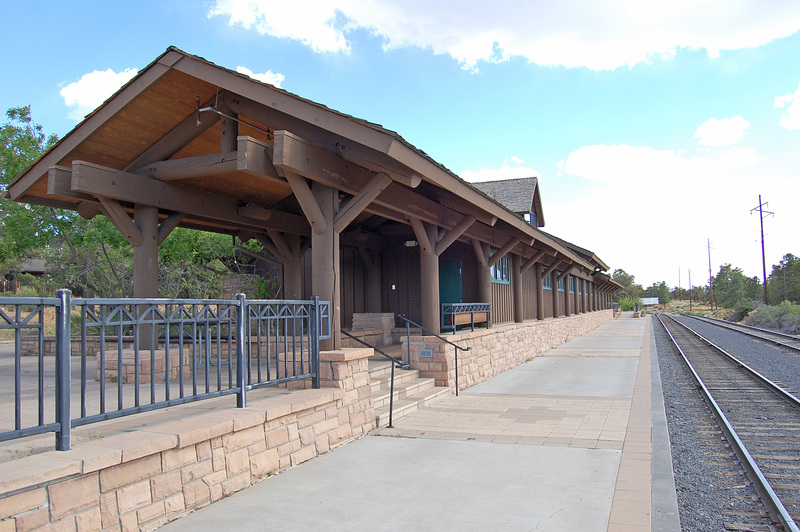 The putative railroad station was built as a terminus for a new Y-shaped light rail system which would have connected a park and ride site at Tusayan (again) with the visitor center. With very few exceptions, day visitors to the Grand Canyon would have been required to leave their cars at the park and ride site, not even being allowed to drive them in to parking lots in the park (as they still can today). 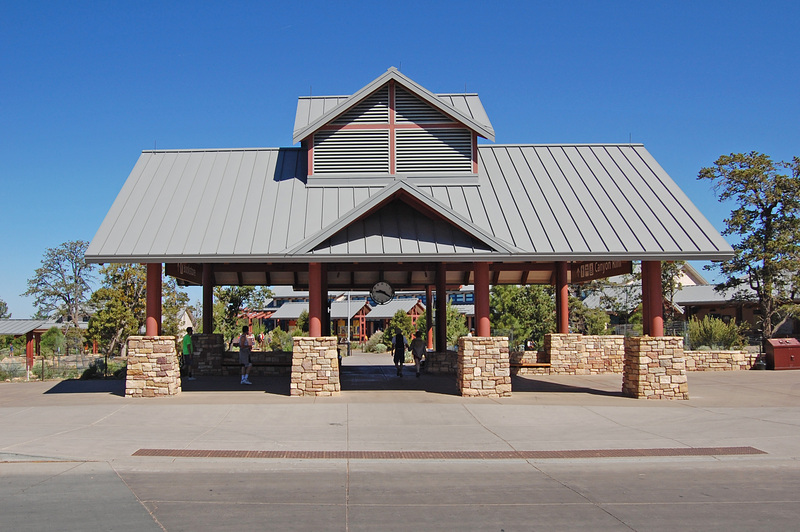 The Visitor Center would then have acted as a first point of contact with the Grand Canyon for most visitors, though tourists could have stayed on to be transported onwards along the other arm of the Y to Maswik Transportation Center (yes, there again). Within the park, shuttle buses would have connected with the light rail stations to provide onward travel. This time the plans progressed far enough to see the construction of the new Visitor Center and the light rail station, but not the light rail system itself. Those plans were endorsed by America’s Federal Highway Administration and Federal Transit Administration, and were apparently also on the receiving end of considerable personal enthusiasm from Bruce Babbitt, secretary of the interior to then President Bill Clinton. They were not, however, universally popular. There is a strong vein of American opinion which views governmental involvement with people’s personal lives with deep suspicion, and when it comes to transport this can be exacerbated even further. Not only were taxpayers’ dollars to be spent on public transport (anathema to individualist thinkers and small-government supporters) but the scheme would lead to an enforced ban on private car access to the park. It wouldn’t even be a fair competition between car and tram with people able to choose which method they used. A critique of the plans can be found here, published by the Goldwater Institute (a conservative policy think tank that campaigns, amongst other things, for small federal government) and I think it’s fair to say that it reflects the opinions in the paragraph above. Such controversy didn’t stop the National Park Service building the light rail terminus and Visitor Center however, with the complex opening in 2000. That was despite the fact that the light rail scheme hadn’t been signed off by that point. Brad Traver, a National Park Service officer who wrote the long-term management plan for the Grand Canyon’s future was quoted in the New York Times in 2002 saying that this was “a way of establishing momentum” (the original New York Times article is here). Unfortunately, the political wind promptly changed with the 2000 presidential election, and the light rail scheme was abandoned. I’m hoping that they’re in a state of construction, rather than deconstruction, but no-one quite seemed to know when I asked. 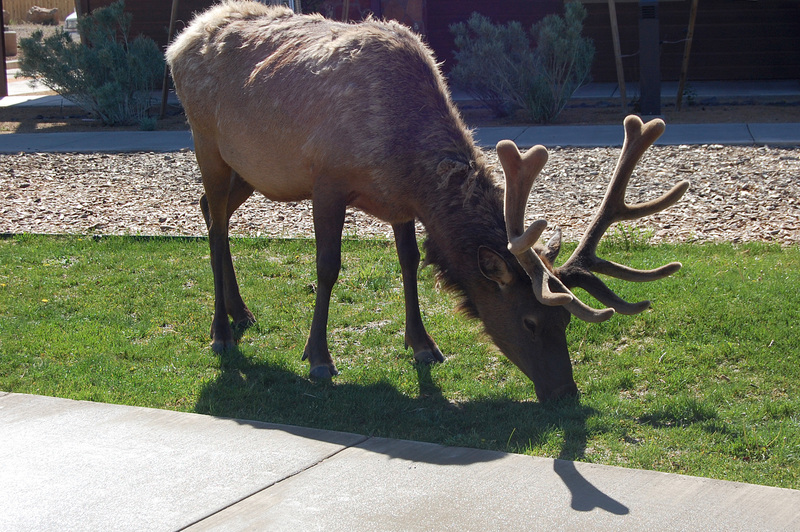 The one above did provide a unique experience in my public transport travels so far, which was waiting for a park and ride bus in the company of an elk, which was nibbling the nearby grass for its breakfast. I had had pancakes, so it was quite clear which one of us had got the better deal. While we’re at it, look carefully at the top of the bus stop pole (you might need to click on the image to open it a larger size) and you can see a sort-of-Native American design cast into the metal. What a thoughtful piece of styling. The failed light rail scheme wasn’t quite the end of the story of improved rail access to Grand Canyon National Park. By 2004, the Grand Canyon Railway was having another go at converting itself into a major sustainable access mode, through conversion to high speed train operation (as reported in the Tucson Citizen here). Needless to say, the project wasn’t taken forward. Looked at from a European perspective, the issue of access to the Grand Canyon is quite fascinating. If European sensibilities prevailed in America, cars would already have been banned from entering the park and all access would be on some kind of public transport. The proposed light rail system would most likely have been built and practically everyone would nod sagely and agree that it was the best way to ensure sustainable access. The irony is that most European national parks are too small, and attract too low a number of visitors to justify such a scheme in Europe itself, whereas Grand Canyon National Park is huge and attracts enormous numbers of visitors. But that’s not the American way. You can still drive right into the national park, and large parking lots are located on the inside, rather than outside the park. It’s either an environmental disaster, or a victory for individual freedom, depending on your point of view.